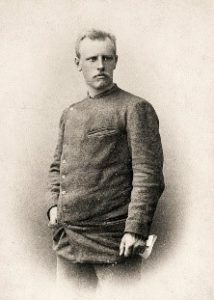 FRIDTJOF NANSEN (1861-1930) – Norwegian biologist, oceanographer, polar researcher. Commissioner of the League of Nations for Refugees, laureate of the Nobel Peace Prize in 1922. In the years 1887-1888 he was the first person to ski through Greenland. During the wintering season, he lived with the Inuit in the igloo and gained experience in surviving in polar conditions. He wrote a book “Eskimowie, their country, life and customs” 1891. In the years 1893-1896 he managed the expedition on the FRAM ship. At that time, the ship frozen into ice cream traveled from the New Siberian Islands to the strait between northern Spitsbergen and Grenada (now Fram Strait). The oceanographic measurements made during the trip changed radically the depth views and proved the constant movement of the ice cover of the Arctic Ocean. During the cruise, he attempted to reach the North Pole through the ice. He reached the width of 86o ,13,6 N.
After the expedition, he ended his polar activity, became a professor of biology at the University of Christiania (Oslo), and then the ambassador of Norway to the United Kingdom and the Commissioner of the League of Nations for Refugees. In 1922 he received the Nobel Peace Prize.